After a successful 2012 season as a newly-assembled team, the Sovereign-Star Racing partnership announced plans on Jan. 3 to further expand their National Hot Rod Association (NHRA) Pro Stock Motorcycle program to include a third racer and a Suzuki motorcycle in addition to the two Buells that they currently run. The team, which assembled for the first time only a few weeks before the start of the 2012 season, finished the year at No. 7 with rookie driver Scotty Pollacheck and also claimed the No. 11 spot with their second rookie, John Hall. Both racers were also nominated for the 2012 Automobile Club of Southern California Road to the Future Award and set new team records throughout the year. AHDRA three-time National Champ Chaz Kennedy will represent the Sovereign-Star Racing team at several events this season as he and the team work to prepare him for full time competition. The 2013 Sovereign-Star Racing team will once again include Scotty Pollacheck and will also welcome fellow Pro Stock Motorcycle racer Michael Ray, who broke the Harley-Davidson Screamin’ Eagle/Vance & Hines team’s 13-event winning streak with his first NHRA national win at the Dallas AAA Texas NHRA Fall Nationals last year. Ray’s 2012 season was sponsored by Gottspeed Racing, with Viper Motorcycle Company also contributing as an associate sponsor during his last six races in the Countdown to the Championship. Ray also partnered with Matt Smith Racing for his engine program and tuning throughout 2012, which will now be provided by the Sovereign-Star Racing team. “I met Jenõ (Rujp) when George and Sovereign teamed up two years ago when they made their European Championship run. They knew that we were an option (for the future),” Ray said. “I’d done a pretty decent job of driving the bike last year. When Viper (Motorcycle Company) and some other associate sponsors didn’t come back (for 2013), it made total sense to come back and team up with Star and Sovereign for this year. Chaz Kennedy is shown above at George Bryce's Pro Stock Motorcycle Drag Racing School in November 2012 at the Auto Plus Raceway at Gainesville, Fla. In addition to Pollacheck and Ray, Sovereign-Star Racing will also be developing a third driver as 18-year-old rookie Chaz Kennedy joins the team for several 2013 races. The crew has also brought back their PSM Suzuki engine program to fine tune and experiment with this third bike during the season in addition to the two Buells that they currently run. 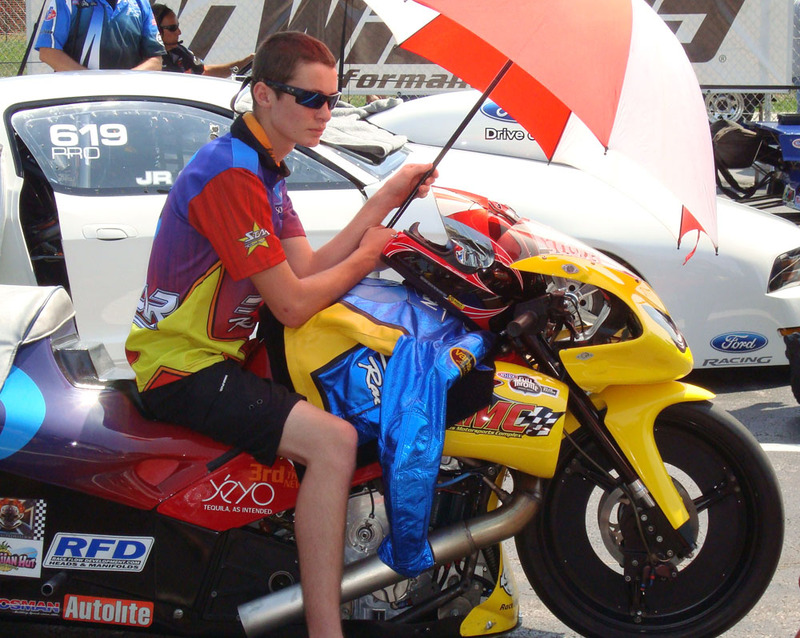 “Chaz is a student of ours and has been to (my drag racing) school a couple times. We’ve decided to bring him in as a developmental driver for 2013 and have him practice and train on our new Suzuki to get him ready for NHRA professional competition,” Bryce said. “Chaz may not run until September. It just depends on how fast the Suzuki is; when it is fast; and how soon Chaz is fast. We decided to bring back the Suzuki because we haven’t run one in a while and we were going fast when we stopped running one in 2003. 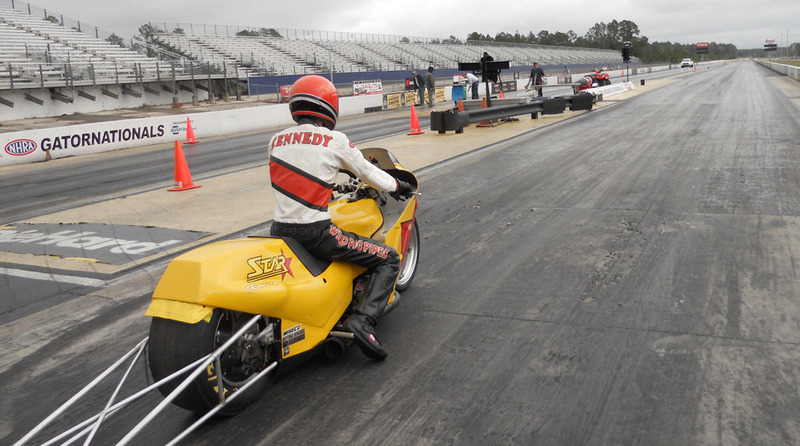 In 2011, Kennedy, who has been racing motorcycles since age 5, claimed three All Harley Drag Racing Association (AHDRA) National Championships and was named AHDRA Racer of the Year. He was also named as the 2010 AHDRA Rookie of the Year. Kennedy’s 2012 season ended before it even began when he suffered a severe leg injury at Gainesville Raceway that required several surgeries and months of physical therapy. 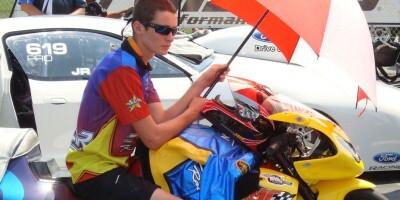 As the son of Chuck Kennedy, the Sovereign-Star Racing crew chief for Pollacheck’s Buell, Chaz assisted the team at three races during the 2012 season. “I’m honored to have George offer me a ride … You know he’s the best and you can see after his success with Angelle (Sampey) that a lot of people would give anything to ride with him. So, it’s an honor. I’m very proud to be able to say I’ve had the chance to come out and compete in the NHRA,” Kennedy said. 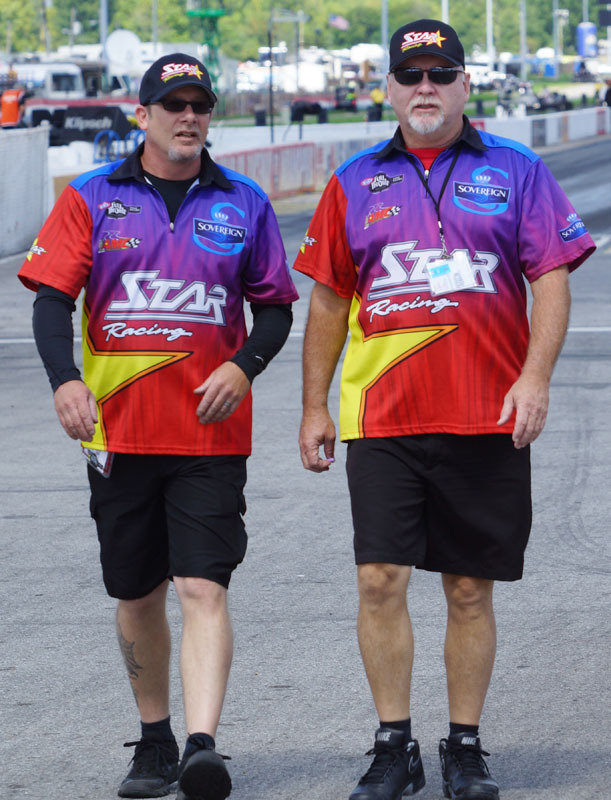 Shown above are Sovereign-Star Racing crew member Chuck Kennedy and Star Racing owner George Bryce during the 2012 NHRA season. “We picked Chaz because he’s a current student of mine; he’s 18 years old; he’s a featherweight; he’s a good racer; and his success in AHDRA has been outstanding. He has a lot to learn, a great attitude and a lot of respect for our team,” Bryce said. 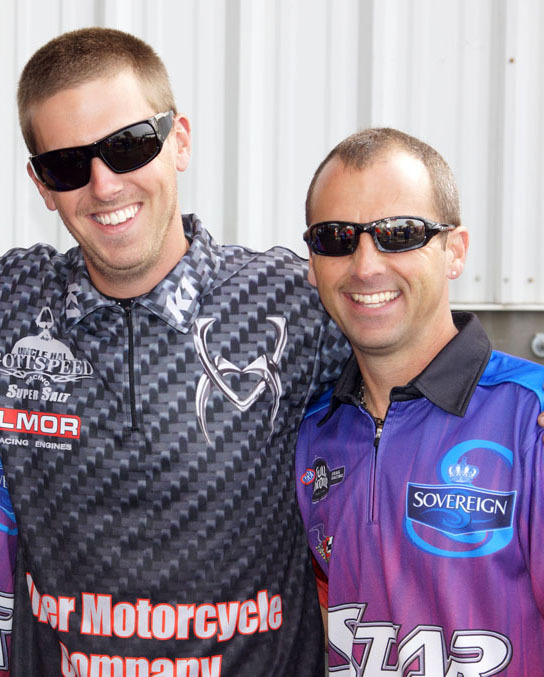 Although the Sovereign-Star Racing crew is sad to see friend and fellow teammate John Hall go this season, they are very hopeful about the possibilities from this new combination of racers. “I’m sorry to see that John is not coming back, but I really like Chaz and Michael Ray so I’m looking forward to working with those guys. I really like John and working with him was great, but I’m also excited about this year. I’m really looking forward to coming out at the first race and being ahead compared to last year,” Pollacheck said. “We have a lot of equity in Scotty. We’ve already been through the rookie phase and startup phase where you’re constantly learning from each other, so now we get to hit the ground running with all that behind us! We know what to expect of each other; we know what each other is capable of. Scotty knows what Star Racing is capable of. Plus, he qualified third at the last race and we know that there’s even more potential there,” Bryce said. Ray and Pollacheck will compete in their first national event as Sovereign-Star Racing teammates during the March 15-17 NHRA Gatornationals in Gainesville, Fla.
Michael Ray (left) will join Scotty Pollacheck (right) on the Sovereign-Star Racing team as their second full time Pro Stock Motorcycle racer for 2013, after previous 2012 driver John Hall made the decision not to run a full NHRA circuit again. The 2012 Sovereign-Star Racing Team is a partnership between Georgia-based Star Racing and the Hungarian-based Sovereign Racing Team, the 2011 UEM European Pro Stock Bike Championship Team, owned by sugar distributor Jenõ Rujp. The Sovereign-Star Racing Team would like to thank the following sponsors: Sovereign, Star Racing, Americus Motorsports Complex, S&S Cycle, Daytona Sensors, Worldwide Bearings, CP Pistons, Permatex, Cometic Gaskets, and Quality Tire.